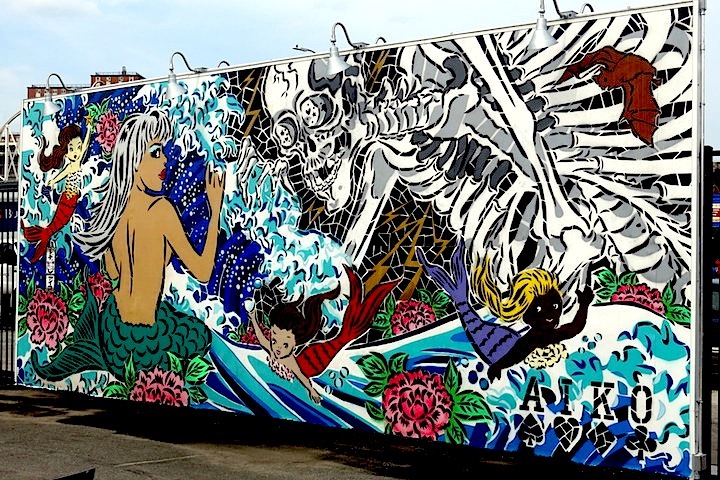 Lady AIKO, The Tale of Mr. Skull and Mermaids (2015), a street art mural first shown at Cony Art Walls, Cony Island, is heavily influenced by the Edo era Ukiyo-e prints that form an important part of Japanese visual culture. To visit Japan in person is to be immersed in a non-stop aesthetic experience—an experience shaped by visual storytelling, fantasy, space-making, and attention at every level to artful detail, ranging from the luxurious to the most everyday and banal. This was perhaps my biggest takeaway impression of a place that has been at the very top of my travel bucket list for as long as I can remember. Not surprisingly, the country that has popularized manga and anime into universally recognized forms of mass contemporary visual culture also has a deeply entangled and shared history with Western forms of art. Enter Ukiyo-e print culture, and my own deep fascination with how representations of Japanese urban life came to influence the art of the fleeting and the everyday pioneered in Europe by the Impressionists and modern avant-garde art movements . Translated, Ukiyo-e literally means “pictures of the floating world” and helps categorize a style of Japanese woodblock painting and printmaking from the early 17th to late 19th century Edo period. Innovating techniques of production and wide distribution that would allow for popular consumption of these images throughout Japan and then around the world by the late nineteenth century, talented Japanese artists turned to printmaking as a way to connect with and share art to the widest possible audience. Importantly, the subject of Ukiyo-e prints references the fleeting nature and everyday instances of urban life, emphasizing pleasure, beauty, landscapes, and the fashions of the time. This, and overt references to the transformative nature of city life, would come to influence and align with French poet and art critic Charles Baudelaire’s challenge to artists of his time—to represent and draw inspiration from the everyday and ephemeral urban world around them, and not slavishly adhere to the traditions and forms of the ancient past. Critically, for Baudelaire, and the new generation of modern and avant-garde artists he would come to influence, this was more than just a change in the subject or content for art, it was also equally a revolution in the form of art. Edouard Manet, Portrait of Emile Zola (1868). Note the presence of Ukiyo-e prints on the far left and upper right register of Manet's painting-- a nod to the fashionable Japanese print culture that was part of the Paris urban scene from the mid to late 19th century. The critical discussion of Ukiyo-e prints forms a key section of any course where I discuss the turn towards modernism in art. Representing the contemporary world was considered a revolutionary move away from the guiding purpose of high art, since at least the time of the Renaissance, to value images of the biblical past, historical record, and images of universal values and truths via metaphor. Turning instead to the banalities and fleeting moments of everyday life, in all of its messiness, incompleteness, and contingency, the role of artists as it emerged under the modern and avant-garde movements of the late 19th and early 20th centuries was less about being the purveyor of some kind of “truth” via their representations, and more about complicating and even calling into question the possibility of ever seeing or representing the complete world one sees with their eyes. The flatness, stark colour contrasts, and often incomplete visions of Ukiyo-e prints provided one of the important influences to modern artists of the late 19th century who attempted to work out a new way to make the images Baudelaire was calling for. Turning, for example, to artists such as Edouard Manet, Mary Cassatt, Vincent Van Gogh, and Henri de Toulouse-Lautrec (see image comparisons below), we can see the influence of Ukiyo-e prints in the way content and form shifts in these artists works away from more traditional, figurative, and mimetic representations, towards the flat, divided, and unmodulated colour palettes of the Japanese. As I tell my students, new ways of making art cannot come out of a vacuum, and we now know that these artists were very much studying the work of Japanese printmakers when formulating new directions for their art practice. It was with this rich context in place that I planned a visit to one of the most important museums and workshops of Ukiyo-e printmaking in Japan, the Hiroshige Museum of Art in Shizuoka City not far from the famed Mount Fuji, on the south coast of Japan. At the museum, which houses one of the largest collections of Utagawa Hiroshige’s prints, I was able to finally view a wide range of Ukiyo-e prints in both painted and printed form, and learn much more about the printmaking process that effectively placed affordable artworks in the homes of Japanese people for several centuries. At the time of my visit, there was a special exhibition of Ukiyo-e prints from the early 19th century depicting samurai and geisha entertainment culture that would further influence later artists of the era the Impressionists would be looking at (see my photographs below). We were also able to see side by side comparisons of Japanese prints and Van Gogh works where the undeniable influences and even borrowing were apparent. 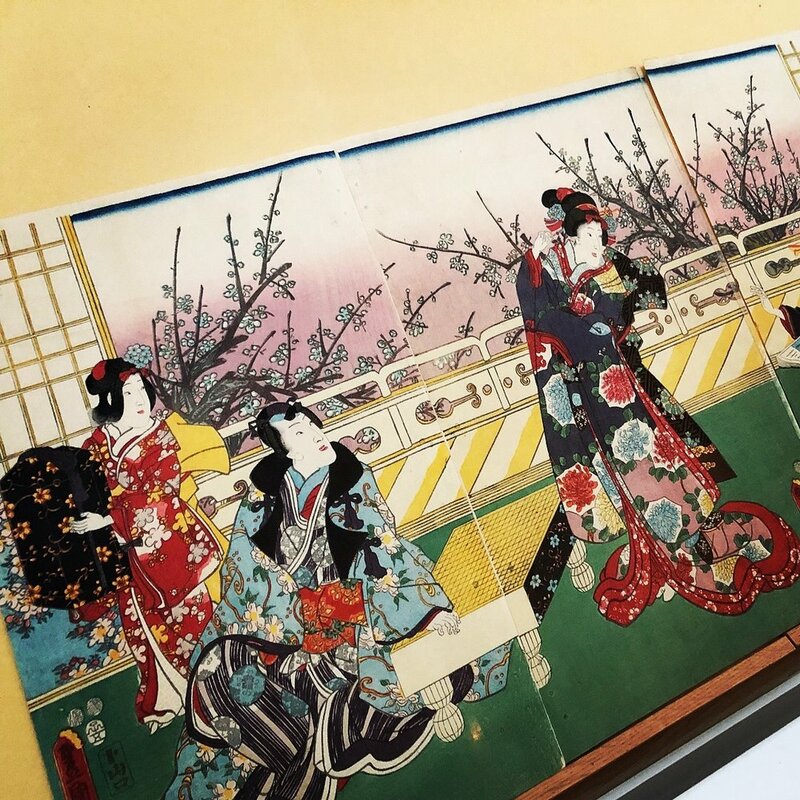 Finally, the museum also encouraged visitors to dress up and perform as subjects in their own virtual Ukiyo-e print, complete with kimonos and a well lit space suitable for photographing and sharing. As one of the guides told me, it was the intention of the museum to encourage active participation in a visual culture that gave visibility to everyday people and their lives. Another fascinating section of the museum was the exhibition of contemporary art works influenced by Ukiyo-e print culture. Notable among them were the work of two UK artists. The first artist, Emily Allchurch, uses photographic collage to rework one of Hiroshige’s famous prints of Mount Fuji in Tokaido Road (2013), while the second artist, Carl Randall, and his work titled Mihni no Matsubara (2016), depicts crowds of selfie-taking young people and tourists, a contemporary subject matter, explored through the formal conventions of oil painting. I enjoyed examining these works up close and seeing how the museum made space for contemporary art works such as these to continue the conversation linking Ukiyo-e print culture to a global modern world with its fascination for the ephemeral, the urban, and the everyday. by many generations of the Edo period to today." The vivid poster for the Lady AIKO collaborative exhibition on this spring at the Hirsohige Museum of Art. The show features two large rooms including one featuring prints from the collection displaying the life of girls depicted in Ukiyo-e prints, and the second room with the large scale mural The Tale of Mr. Skull and Mermaids (at the top of this page)—a work that AIKO first showed in Brooklyn, inspired by the intersection of “pop culture” of the Edo period and that of contemporary New York—and the original woodcut AIKO created with the museum titled American Dreams (featured in the above poster). I hope one day to see this work in person as well (Japan, I will be back!) but it is clear that the legacy of Ukiyo-e lives on in the way that the medium was clearly intended. 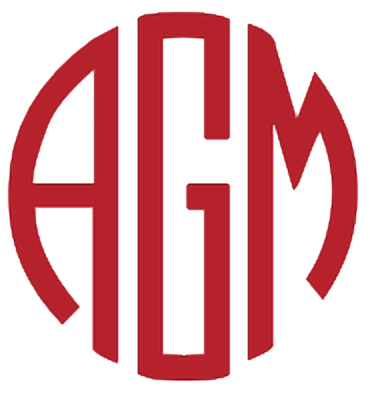 Guth, M.E. Alicia Volk, and Emiko Yamanashi. Japan and Paris: Impressionism, Postimpressionism, and the Modern Era. Essays by Christine Honolulu Academy of Arts, Honolulu, 2004. Morse, Anne Nishimura, Shūgō Asano, and Museum of Fine Arts, Boston. Drama and Desire: Japanese Paintings from the Floating World, 1690-1850. 1st ed. Boston: Museum of Fine Arts, Boston, 2007. Tinios, Ellis and British Museum. Japanese Prints: Ukiyo-e in Edo, 1700-1900. Burlington, VT: Lund Humphries, 2010.